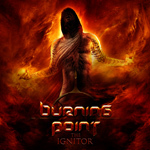 For their fifth album, The Ignitor, Finland's Burning Point played it smart. They're sticking to the tried and true classic melodic and heavy power metal that made the preceding Empyre such a well-rounded album. Burning Point: somebody forget their chains. Therefore, as a point of fact, we can call The Ignitor a typical, but also very solid, Burning Point album. Good melodies, good hooks in lyrics and chorus, and a bunch of impressive traditional metal guitar solos make this an entertaining and predictable listen. Certainly, one could say, this is common fare for European power metal, and that person would be right. Yet, some songs here move with some deft craftsmanship that only comes with maturity. Notable are In the Night, Heaven Is Hell, Everdream, and the magnificent Silent Scream, by example. (And that does not necessarily dismiss the rest.) Again, is Burning Point reiventing or revitalizing this long lasting and stubborn genre, or themselves for that matter? Not hardly. But listening to the ambitious speed and power of Eternal Flame and Holier Than Thou or the rich vocal harmonies of Lost Tribe, you catch the strength of a band equal to its peers. Fundamentally, The Ignitor finds Burning Point in fine form, and doing melodic power metal with strength and agility. Easily recommended if you dig the scene.